A short post to let everyone know about some new images I’ve added to my website. They are in the gallery “Bryan’s Favorites”. #506 – #510c. Some insight on the new images available as prints. There was a time many years ago at the lava flows with in Hawaii Volcanoes National Park when lava tube skylights were quite common. All you had to do was follow the well established Laeapuki lava tube inland from the coast to find them. Skylight hunting at night was easier but, I very much enjoyed daytime skylight hunting too. For those of you who don’t really know what a skylight is, it’s a window into an active lava tube allowing one to see the fast flowing lava advancing underground to the lava flow front. The most common way they are formed is when the tube is filled by a sudden surge of magma. The surge causes a weak section of the tubes roof to break away. When the section of roof survives in one piece and remains nearby it’s called a manhole cover. An example of one can be seen here. It’s a very rare sight to see. This one popped out as I was approaching the scene. I could write a book based on my adventures that night/day. These particular skylights were captured during the Laeapuki eruption. Both were on the flats below the pali. One quite close to the ocean entry. The closer one also had a cloud of toxic gas hovering low to the ground all the way to the ocean entry. They often emanate from active lava tubes when the upper crust is thin. While it won’t kill you on the spot, its atrocious to the lungs. Always best to avoid this blue smoke unless you have a respirator. Even more so due to the thin unstable crust over the lava tube. If you see several tiny glowing holes with a yellow sulfur build up around them, stay away as these are often new skylights in the making. There’s a good chance you will fall through. This leads me to my usual warning. Stay away from skylights unless you absolutely know what you are doing. I don’t mean you think you know what you are doing. That will lead to something disastrous. Understanding skylights takes years of field work. I’ve hiked to well over 100 of them. 21 in one day back in 2002. Click on the link above or the photo below to view the new images. Prints can be ordered directly from my website or if you are on the island, visit Krazy About Kona in the Kona Inn Shopping Village on Ali’i Dr to buy prints. 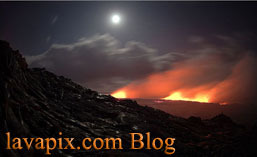 To see a great video of lava flowing through a lava tube viewed via a large skylight, click here. This video shows something very unique that’s rarely seen. Cooler lava from the upper chamber flowing onto the fast-moving lava of the main tube. My timing couldn’t have been better as once coming back to the skylight several hours later, it was nearly sealed up. Laeapuki skylight, Kilauea volcano, Hawaii. Wow, almost one year since my last post. Being busy will do that. This posting will cover something more people do now than ever before. Shooting photos with your camera phone or even a GoPro camera. Now of course images from either aren’t going to print like what I get from my Nikon D800 but, you can get great results for general sharing. The GoPro Hero 3+ I now use as my quick video camera also shoots great images once you understand how to do so. Basically its a fixed 2.8 f-stop which means shallow depth of field so, be sure on your focal point. Which really isn’t all too important if your shooting at the cameras widest angle setting. It’s really the only setting I use because depth of field is better. View the gallery here. I find myself using the camera on the Moto X more than anything. View the Moto X gallery here. Lots of images to browse through. My D800 is only for the absolute important work for the gallery’s. Be sure and visit each gallery to view many other images. I’ve added a new gallery “Bryan’s Favorites“. Also a new page on my website dedicated to my “Fire and Ice” image. This past April I was invited to do a speaking engagement for a business conference at The Mauna Lani resort. My images and video were displayed on a beautiful 70″ HD television (everyone wanted to take it home) and I had a few large metal prints there. This went very well and I must say I enjoyed it very much. Met tons of great people who were captivated by both my work and my stories. 22+ years of lava flow adventures leaves me with plenty to talk about so, only having 1.5 hours to do so was a challenge. The resort employees were a great help setting everything up along with the conference staff. Mahalo Cindy and Patty. So, this is now a new service I offer to resorts and visiting conferences. Having plenty of great material, no talk will ever be exactly the same. If your interested in having me speak at your conference or resort, visit my services page for more information. There’s plenty to more to cover from the past several months but, I will get to that later. I want to keep this post relatively short. Maybe some time this year I will post about my 27 mile hiking adventure. No camping and 20 hours on my feet. A marathon while carrying 65 lbs of gear. With all of the zigzagging around it was surly a few more miles. This is a great example of why when people say to me “I’d love to hike with you” I say, “No you wouldn’t”. Don’t forget to visit my Youtube channel – lavapix. New videos of all kinds being added throughout the year. Time for my usual warning. Well, not the usual. Don’t expect too much from your phones cameras. Understanding their limits will allow you to capture great images. A note on the current lava flow that’s going in and out of huge cracks in the dense forest. Stay away!! These cracks are huge with unstable edges. The lava flow can suddenly appear from underground trapping you. I explored the area many years ago anticipating future flows reaching this area. If lava reaches the farms outside of Pahoa, leave the residents alone. Just letting you know that I have a new in depth blog post coming soon. It will be about my adventures at the lava flows, Jan – July 2013. There are several videos to be viewed along with the new image galleries. It was an amazing seven plus months of difficult but, enjoyable hikes. If you haven’t yet, be sure to subscribe to my blog for automatic notification of updates. Well, I was planning on posting this later but, seeing I’m part of the official media release, I guess I can post it now. In August of this year I was involved in a filming for Discovery Channel Canada’s Daily Planet show. I took one of the hosts Ziya Tong out to the lava flow ocean entry. Yep, she was fortunate enough to spend the night hiking in the rain with a great looking guy. Think back to this when you read the part about sarcasm. Of course there was the film crew too. They were a good bunch of people and we had a great time. The rainy weather I warned them about made sure not to disappoint. It rained quite often. This slowed us down so, we weren’t able to do everything that was planned but, now it gives Ziya a reason to come back. I think I did well with the filming. There were a few re-takes but, not many as the crew was very good at directing. Plus, having just filmed another show several months earlier, I pretty much knew what to expect. I would have liked to have been more my usual sarcastic self but, with the time crunch we were under I didn’t want to cause delays if they didn’t like what I had to say. Once the show airs I will tell you a few of the things I was about to say but, caught myself and was more cordial. Overall the activity was subdued compared to what I’m use to but, plenty for the first timers. Don’t want to overwhelm people. Its happened before. We were very fortunate as the lava flow in that area stopped completely several days later and has yet to resume. The crew wasn’t up to my usual 15-20 mile hikes. They shouldn’t feel bad as few people are. I haven’t seen the final show and most likely won’t until most of you do. Obviously the majority of you reading this don’t live in Canada but, not to worry. I believe it will also air online. Once I have that info I will post a link as an edit to this post. They have me a part of their “Adrenaline Junkies” week. Now that really doesn’t describe me well because hiking the lava flows isn’t an adrenaline rush for me. Might be for those that on a rare occasion get to hike with me but, its much the opposite as I find the lava flows very relaxing. I guess to some degree there is adrenaline to get myself to drive 5 hours round trip, then many times hike 15-20 miles in the middle of the night and be out for 12-15 hours. Adrenaline and natural green tea certainly help. I made sure they knew I was very much safety oriented and very well prepared. I’m pretty sure this is how I will be portrayed. I never want to be portrayed as one of those daredevil photographers at the lava flows. I know what I’m doing. There’s no need to be a daredevil. I’m not out for my 15 minutes of fame. Production companies approach me. If I like what they want to do, we do it. If not, I pass. Several of my images are featured in the show along with some of my video clips. I will be watching the segments of the four other guys mentioned in the release. Especially Garrett McNamara. I surf too but, nothing like what he does. Once its online I will send out another alert. Check out the media release here. Media link might not be working. Show airs Oct 8 at 7 pm (EST). ***Watch online here***And or here too. The hosts talk briefly about the experience on the 2nd link. I’m in the second half of this clip. Feel free to share a link to this post on your favorite social network. The image below is Ziya and myself at the ocean entry (credit, Christine Mayall, Producer at Bell Media).